Veggie burgers are taking over the world, and this is your comprehensive guide to finding 15 of the most popular in New York City. From classic favorites to the most unique, we came up with a list to ensure that no matter where you are in the city, you’ll always be able to satisfy your veggie burger cravings. We chose these products based on Yelp reviews and popularity but also used our discretion to be certain that we were being fair to the many contenders – there are so many great veggie burgers out there! This list is not based on ranking, priority, or any other particular order. All reviews are real, from real Yelpers. And guess what?! In addition to being vegetarian, they are all vegan as well. Happy eating! Below are the 15 most popular vegan / veggie burgers in NYC along with real quotes from people who have tried them! Quinoa and nut-based patty, iceberg lettuce, tomato, dill pickle. 1. “I’ve said it before and I’ll say it again: I’m a meat eater! The vegetarian burger at Superiority Burger is one of the most amazing burgers I’ve ever put in my mouth.” – Michelle C.
2. “This place makes plants sing sweet sweet love songs to your taste buds, and all those songs should win Grammys.” – Russell H.
3. “The only thing besides $1 pizza that I could happily eat every day and never get tired of.” – Andrew B. 4. “Delicious veggie burger with great texture and flavor. Get the burger and the broccoli salad (amazingly flavorful!!! ).” – Maancy M.
5. “This is hands-down the best veggie burger I have ever had.” – Kurt W.
Black bean patty, vegan cheddar, green leaf lettuce tomatoes, raw red onions, cilantro lime dressing. 1. “I’m vegetarian so finding an amazing veggie burger can be difficult. To my amazement they had an awesome selection! You could pick a black bean patty, quinoa patty, or portobello patty.” –Angelica C.
2. I ordered the habanero burger, with the black bean patty… Everything about the burger was perfect.” –Amy P.
3. “Bareburger’s veggie burger OWNED. Fresh, tasty, crispy on the edges but still moist (EEEK) on the inside, served on a delicious bun – everything a veggie burger should be.” –Laura P.
4. “I was really pleasantly surprised by the two veggie burgers we tried. I’m always skeptical of veggie burgers, but if for whatever reason you want or need to eat a veggie burger, would highly recommend.” –Sabrina L.
5. “Their veggie burger is a real burger, it doesn’t fall apart. No big hunks of veggies waiting to drop at any moment… Stayed intact, and delicious, the entire time. ” –Alexandra S.
A zesty soy patty with blended garden veggies. 1. “Their veggie burgers will make you appreciate veggie burgers as more than just a ‘substitute. '” – Brandi G.
2. “I opted for the simple Grilled Veggie Burger, with a side of french fries and chipotle mayo. It was delicious. The buns were soft and the patty was so full of flavor, it was probably better than most meat burgers I’ve had.” – Victoria L.
3. “This was the first time I actually enjoyed a veggie/vegan burger. That’s huge to me.” – Grand Y. 4. “One of the best veggie burgers I’ve ever had – it actually had FLAVOR!” – Rima C.
5. “It’s the best burger I’ve had in a long time, and I’m not even just counting vegetarian burgers; so good.” – Yuriy N.
Grilled vegetable and mushroom burger, bread and butter pickles, aioli and ketchup, potato roll. 1. “Not only is their veggie burger not an oxymoron, but ONE OF THE MOST FLAVORFUL MEALS we had both had in a long time.” –Mck ..
2. “VEGGIE BURGER. You MUST get this if you are in Pickle Shack. Or even in the neighborhood! The patty and bread MELTS into your mouth.” –Jing X. 3. “The veggie burger was amazing. Hearty, spiced incredibly, and very filling.” –Joanna V.
4. “Crown these peeps the new king of the New York City veggie burger.” –Stephen A. 5. “I come here for their exceptional veggie burger. It tastes solid. Very flavorful and cooked to perfection. Make sure to order it with a side of hand cut fries, their special hot sauce and thank me later ;)” –Yasmeen F.
Garden veggie patty with your choice of toppings. 1. “Absolutely my favorite veggie burger in town!” –Nicole D.
2. “This is my number one place in the city to specifically get a Veggie Burger. The burger is caramelized on the outside and soft and juicy on the inside, made of mashed veggies.” –Anonymous a. 3. “I had the veggie burger, which really hit the spot. Fresh ingredients. The bun was really delicious too, which is rare.” –Amalia M.
4. “I ordered the veggie burger and it was better than I expected. Crispy outer layer, flavorful not dry inside, and big.” –Canny F. 5. “JBB has the best veggie burger in the United States, hands down. It tastes like an explosion of heaven.” –Liz C.
Crimini mushroom burger, house baked sweet potato roll, secret sauce, Brooklyn Brine pickles. 1. “With ‘secret sauce,’ smoked eggplant, onions, and delish potato wedges, you cannot beat this burger anywhere. Five stars!” –Elliot P.
2. “This is the best burger in NYC, take it from a NY native.” –M P.
3. “[The burger] was outstanding. The bun was uniquely buttery and firmly soft, the patty was flavorful, and the ketchup was tangy.” –Jacob U. 4. “I have stopped in twice for lunch and both times chowed down on the California MOB Burger. Oh snap, is it good! Not once, while tearing into that burger did I miss meat.” –Drex H.
5. “The MOB mushroom burger was one of the most perfect veggie burgers I’ve ever had.” –Colleen N.
Black bean-quinoa-sweet potato patty, corn salsa, onion, guac, tortilla strips, chipotle aioli, whole grain bun. 1. “Seriously the Guac burger was out of this world! I’m not vegan but would recommend to anyone cause it’s delicious, you don’t miss meat at all!” –Sarah S.
2. “The perfect vegan burger exists!” –Susie M. 3. “I’ve never tried a vegan meal before, but have got to say that the guac burger was maybe the best burger I’ve ever had.” –Rusty H.
4. “At by Chloe I had a veggie burger that I wanting to be able to keep eating for the rest of my life.” –Paige M.
5. “The guac burger is sooooooo brilliant. If you’re craving a burger, it’ll hit the spot.” –Samer H.
Savory homemade veggie patty with portobello mushrooms in a whole wheat bun, served with yam and yucca fries. 1. “The homemade veggie Burger is amazing!” –Zoe L.
2. “The Loving Hut Burger is my favorite! I think it maybe the best veggie burger I’ve ever had. Always crispy never mushy or soggy.” –Kimberly F.
3. “The service is always friendly and love their crispy vegan burger.” –Dorim L.
4. “The veggie burger was big, flavorful, and delicious.” –L Z. 5. “You could tell the veggie burger was freshly made and not just a fried patty, and the fries were yummy.” –Yoshi K.
Tomato, alfalfa sprouts, vegan chipotle aioli, pickles on vegan bun. 1. “So incredibly delicious ! Best vegan burger I’ve had in a long time.” –S.D. 2. “If you come here for lunch or dinner the Vegan burger is to die for!” –Callen B. 3. “The burger was absolutely amazing, and the greens that came with it were so fresh and delicious.” –Ashley H.
4. “Incredible and I mean incredible vegan burger. Incredibly fresh made on the spot.” –Jenny K.L. 5. “I eat meat almost every single day, but decided to try the vegan burger … when I came here for the first time. The burger was so good that it is, to date, the only thing I’ve ordered all of the three times I’ve eaten at this restaurant. ” –Collin P.
House made beet pattie, lettuce, horseradish v-mayo, tomato, gluten free pullman bread. 1. “The $8.75 Beet Burger was delicious! Whatever is in the beet pattie, it’s not soggy or overly dry. Just right. Vegan mayo, lettuce, tomato and horseradish made the sandwich feel ‘real. '” –Betty Ming L.
2. “I absolutely loved my Beet burger and am now going to try and replicate the recipe at home. 5 stars all the way.” –Tiffany W.
3. ” The beet burger? On gluten free pullman bread? Lord, have mercy on me. I absolutely loved my lunch so much that I brought one home for dinner.” –Toni B. 4. “The burger patty was delicious was very fulfilling with the nutty texture and flavor of the bread.” –Barbara C.
5. “Lots of great choices; I had the beet burger and was not disappointed.” –M K.
Roasted mushroom burger patty on an ezekiel bun, pesto spread, and topped with: vegan cheese, roasted portobello mushroom, caramelized onions, roasted green pepper, guacamole, lettuce, tomato, and sprouts. 1. “Hidden gem in the East Village, the burger is incredible.” –Ross H.
2. “Best darn veggie burger I ever had!” –Rae R.
3. “Their vegan burger is super delicious and has lots of toppings that make it even better.” –Leigh C.
4. “The veggie burgers are awesome enough where even my carnivorous friends leave extremely satisfied.” –Ben W.
5. “The Organic Grill homemade veggie burger is the best veggie burger in the city, hands-down.” –Jaqueline J.
Famously delicious live burger, tomato, basil, caramelized onions and cabbage with live sunflower dill dressing. 1. “The burger was delicious! The burger was crunchy, saucy and the patty itself had great flavor. Loved it!” –Hannah S.
2. “Ordered the bloom burger in a collard green wrap…amazing flavor.” –Fiona W.
3. “Whoa, I have to say the burger was so yummy!” –Laura M.
4. “The bloom burger was also wonderful — there were so many textures going on — juicy tomato, crunchy cabbage, fresh basil and a well seasoned LIVE burger patty — a total flavor bomb.” –Joanna N.
5. “The veggie burgers were insane. There was a thyme olive oil on the plate, dressing crunchy greens, and the burger itself had the whole vegan healthy dense filling yumminess going on. ” –Lama B. A patty of your choice served with lettuce, tomato, pickle and as many extras as you want. 1. “I just got a veggie burger–did I say “just?” That is one [email protected]$$ burger! ” –Fallopia T.
2. “Try the burger with chili and cheese paired with some shoe string fries. It’s incredible and worth the wait!” –Callen B. 3. “My burger was very good, bread was soft and tasty pickles were amazing, my boyfriend who isn’t vegan really enjoyed his burger as well.” –Alexa M.
4. “I’m obsessed with the bacon cheeseburger with chipotle vegan mayonnaise.” –Yolanda B. 5. “All I can say is wow, never had a better veggie or vegan burger in my life! and I’ve had a few!” –Georgia G.
With escarole and roasted tomato jam on a house-made whole-grain English muffin. 1. “The chickpea burger is nothing short of amazing. When it comes to bean burgers, veggie burgers, etc… it can be very hit or miss (usually a miss). Ellary’s however, knocks it out of the park.” –Kevin M.
2. “The chickpea burger was stupid good- the spices in the patty were especially fantastic. 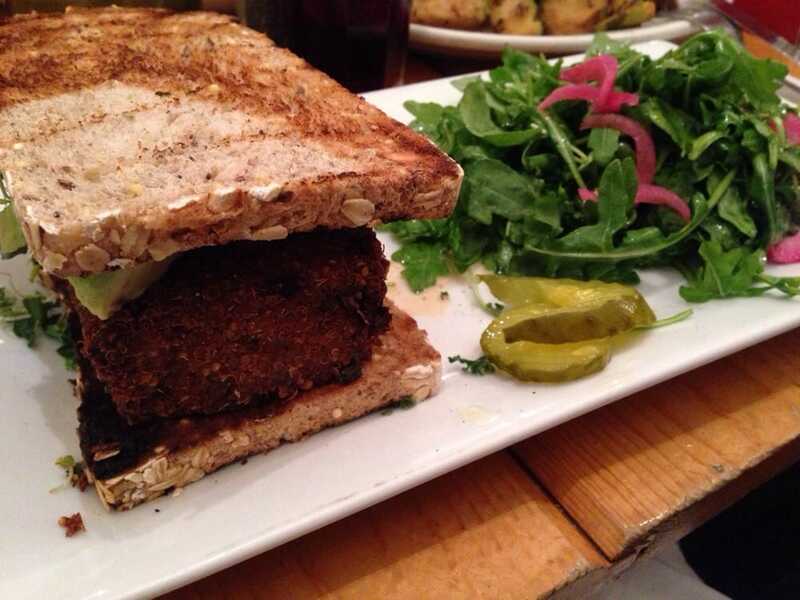 Best chickpea burger I’ve ever had!” –Caroline J. 3. “I ordered the chickpea burger and you can most definitely tell that everything is fresh, authentic, and made with care.” –Allison Y. 4. “Holy moly… the chickpea burger on a gluten-free wrap (food for life) was so so good. I’ll be back again.” –Craig F.
5. ” I ordered their chickpea burger which came on a homemade whole wheat english muffin. The tomato jam on the burger was amazing, as was the burger itself. So delicious, and just the right portion to be satisfied.” –Roseanne R.
With avocado, chopped kale, alfalfa sprouts and homemade Sriracha coconut ranch dressing on toasted health bread with arugula and marinated red onion salad. 1. “I got the crispy vegan quinoa and artichoke burger. So delicious and will be coming back. A+” –Adam W.
2. “The ladies next to us got these amazing-looking crispy vegan quinoa/artichoke burgers with avocado AND sweet potato fries, and I can’t wait to come back here for that combo. ” –Rose K.
3. “…the vegan quinoa burger was a win win…” –Ami P.
4. “The dressing was unique and flavorful, and the burger overall was tasty.” –Emilia R.
5. “Veggie lovers will embrace the soy-free Crispy Vegan Quinoa and Artichoke Burger.” –Ali M.
Don’t live anywhere near NYC but still want to sink your teeth into a tantalizing veggie burger? Don’t worry, here are five amazing veggie burger recipes you can make at home! See 100’s of our Veggie Burger Recipes here! Sarah Cohen תזמיני אותי שם ? או לפתוח כזה בארץ ביחד?